Isaac Munroe St. John (November 19, 1827 - April 7, 1880) was a Confederate army brigadier general during the American Civil War. He was a lawyer, newspaper editor, and civil engineer before the Civil War and a civil engineer after the Civil War. As a civil engineer, he worked for the Baltimore and Ohio Railroad Company, mainly in Maryland, and the Blue Ridge Railroad Company in South Carolina before the Civil War and the Louisville, Cincinnati & Lexington Railroad in Kentucky, in the city of Louisville, Kentucky, and the Chesapeake and Ohio Railway Company, mainly in Virginia and West Virginia, after the Civil War. Isaac M. St. John was born on November 19, 1827, in Augusta, Georgia. He moved to New York, New York, with his parents, Isaac Richards St. John and Abigail Richardson Munroe St. John, and attended Poughkeepsie Collegiate School. He graduated from Yale University in 1845 and became a lawyer. In 1847 St. John became the editor of the Baltimore Patriot. He was a civil engineer with the Baltimore and Ohio Railroad Company between 1848 and 1855. He then moved to South Carolina where he became a civil engineer and chief of construction for the Blue Ridge Railroad Company between 1855 and 1861. 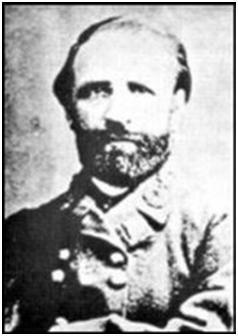 Isaac M. St. John began the Civil War as a private in the Fort Hill Guards of South Carolina in April 1861. By October 3, 1861, he was an engineer in the Army of the Peninsula. By April 1862, with the rank of captain, he was Brig. Gen. John B. Magruder's chief engineer at Yorktown, Virginia, in the Peninsula campaign. On April 18, 1862, St. John became the chief of the Bureau of Nitre and Mining, an assignment that he held until February 16, 1865. In this position, he produced crucial ordnance supplies, including gunpowder and metals, for the Confederate army, even as the Union blockade of Southern ports became increasingly effective. Among other things, he found limestone caves containing saltpeter in the southern Appalachian Mountains. He was appointed major, CSA artillery, on September 26, 1862, and lieutenant colonel, CSA, Nitre and Mining Corps, on May 28, 1863. St. John resigned on January 31, 1864, because the Confederate Senate accused him of protecting draft dodgers. His resignation was refused, and the charge was proven untrue. He was promoted to colonel on June 15, 1864. On February 16, 1865, by special act of the Confederate Congress, St. John was promoted to brigadier general and was appointed commissary general of subsistence because of his procurement skills. He relieved some supply problems through direct acquisitions, but his innovations came too late in the war to make a significant impact. St. John was paroled at Thomasville, Georgia, about June 1, 1865, and was promptly pardoned on June 19, 1865, after having taken the oath of amnesty on June 18. After the war St. John was chief engineer for the Louisville, Cincinnati & Lexington Railroad from 1866 to 1869. Then he was city engineer for two years in Louisville, Kentucky. He became a civil engineer for the Chesapeake and Ohio Railway and ultimately the head of its Mining and Engineering Department. Isaac Munroe St. John died April 7, 1880, at The Greenbrier at White Sulphur Springs, West Virginia. Source of information: Boatner, Mark Mayo, III. The Civil War Dictionary. New York: McKay, 1988. First published New York, McKay, 1959. Eicher, John H., and David J. Eicher. Civil War High Commands. Stanford, California: Stanford University Press, 2001. Hall, James O. "St. John, Isaac Munroe" in Historical Times Illustrated History of the Civil War, edited by Patricia L. Faust. New York: Harper & Row, 1986. Heidler, David S. and Jeanne T. Heidler. "St. John, Issac Munroe" in Encyclopedia History, edited by David S. Heidler and Jeanne Heidler. New York: W. W. Norton & Company, 2000. McPherson, James M. Battle Cry of Freedom: The Civil War Era. Oxford History of the United States. New York: Oxford University Press, 1988. Sifakis, Stewart. Who Was Who in the Civil War. New York: Facts on File, 1988. Thomas, Emory M. The Confederate Nation, 1861-1865. New York: Harper & Row, 1979. Warner, Ezra J. Generals in Gray: Lives of the Confederate Commanders. Baton Rouge: Louisiana State University Press, 1959.